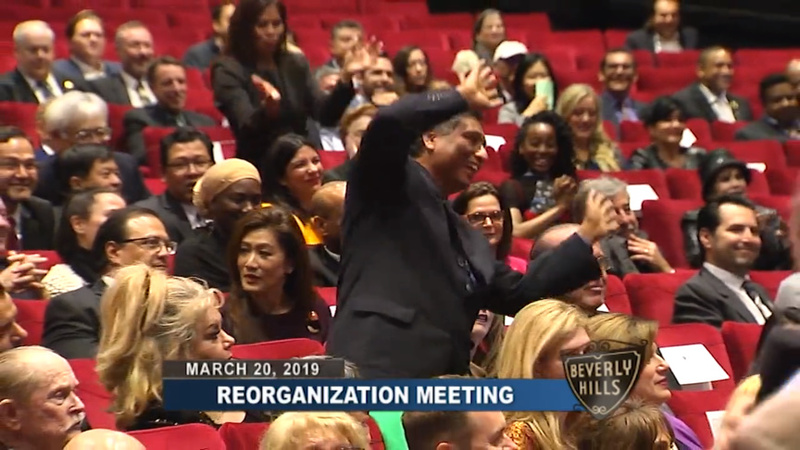 There we were just typing away when LAist got a hot tip: "Go watch the Beverly Hills City Council archived livestream!" As John Mirisch was being installed as the city's new mayor, a musical number just... broke out. It was performed with gusto, like it was a totally normal thing to occur in our daily lives, like we were all fictional characters who get this kind of magic on the reg. We always suspected that meetings held by public servants were often sparsely attended. But now we can say this with more supporting evidence, because this happened last month and nobody noticed and wrote about it. 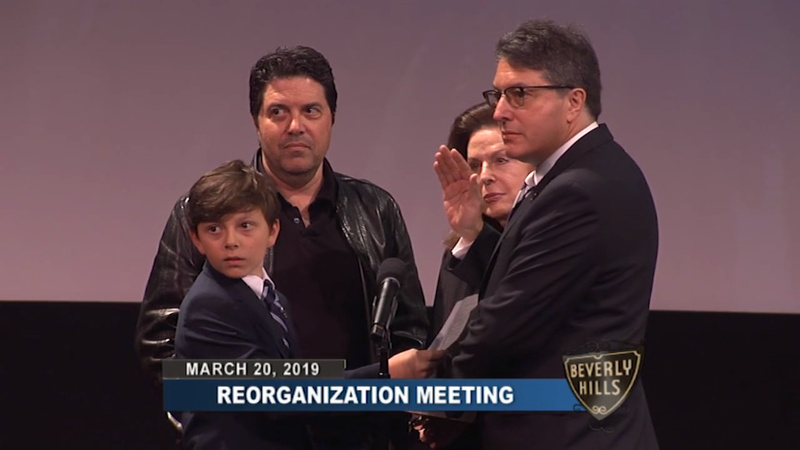 The moment is presented as a surprise, with the oath of office interrupted by members of the audience shouting and calling for more singing. But why? And how? And why again? We talked with Mayor Mirisch to understand just how reality got broken via musical. "We just thought it would be an added element of fun to an event that otherwise is sometimes maybe a little stuffy," Mirisch told LAist. 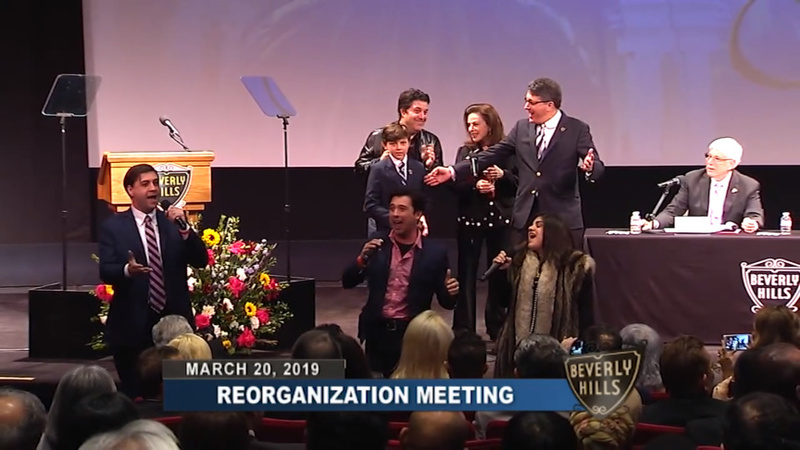 There's normally musical entertainment during the annual installation ceremony — the Beverly Hills mayor position is a ceremonial one, rotating among members of the City Council. But as a huge musical fan, Mirisch decided to do something extra (in multiple senses of the word) for this ceremony. All in all, the musical budget was $2,500, according to the mayor — it's what's usually spent on the music, but this one was on another level. The mayor helped to rewrite the lyrics to a song from Broadway musical Mack and Mabel by legendary composer Jerry Herman, who's best known for Hello, Dolly. "[Mack and Mabel's] got a brilliant score, and it deserves more success than it's had," Mirisch said. Mirisch co-wrote the new lyrics with an old Beverly Hills High classmate, Greg Sherman — who happens to be the son of Richard Sherman of the Sherman Brothers, the Disney songwriters who gave us the tunes for everything from Mary Poppins to "It's A Small World." 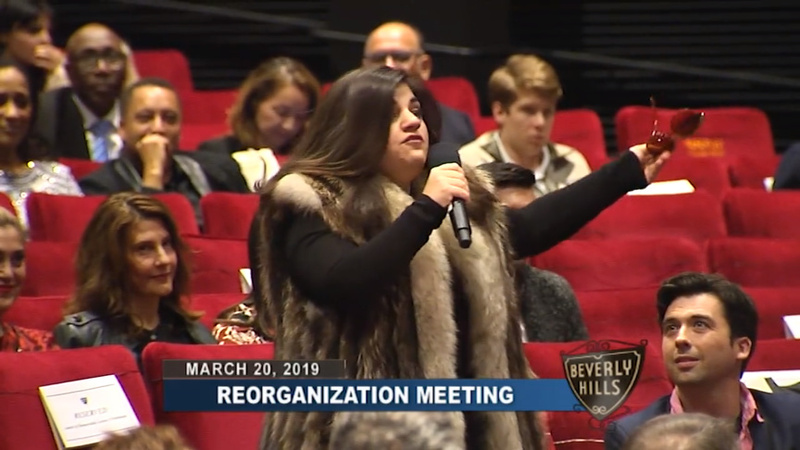 "I wanted to have something where we could sing about what makes Beverly Hills special as a community, and that would leave people tapping their toes. And for my money, that's truly one of Jerry Herman's most toe-tapping songs," Mirisch said. Musician/composer Richard Allen, another of Mirisch's classmates, produced the musical background. Sherman also found the singers and handled rehearsals. They put it all together in two-and-a-half weeks, with Sherman and Allen doing it thanks to their friendship with Mirisch. One of the big inspirations for the surprise musical was Love Actually. "There's the scene at the wedding where they, out of nowhere, start playing 'All You Need Is Love,'" Mirisch said. "It would be nice if there were elements of our lives where people could just burst out into song and have fun like that." Despite his son delivering an acting masterclass in surprise, both Mirisch's son and mother knew about it in advance — though he may not have told his brother, he said. But he didn't want his boy to be too confused, since he was the one administering the oath of office. "And I guess he probably would have wondered why I was playing that song so often in the car when we were driving around," Mirisch said. Mirisch has also been an advocate for public singalongs — the installation ceremony included a singalong to "I'd Like to Teach the World to Sing." He plans more singalongs for throughout his term — ideas include a potential Rat Pack/Frank Sinatra singalong, one of composers who lived in Beverly Hills, and a Broadway-themed singalong. Mirisch is hoping to work with Greg and Richard Sherman on some of those events. He'd also like to add some international flair. "Maybe do an evening of Brazilian-influenced music, or Mexican, or Indian," Mirisch said. The next singalong is planned for a May 2 concert at the Wallis celebrating Israeli independence. One of the mayor's biggest inspirations for the singalong idea: Sweden. He lived there for many years. "When they have good weather, they have these open air concerts, and people all sing along," Mirisch said. "And some have better voices than others — everyone's having fun." While he loves a musical, Mirisch himself doesn't have much of a background in music — but he wants people like him to sing anyway, encouraging people to sing out without worrying about singing well. "We all have a song in our hearts," Mirisch said. He lamented the decline in public singalongs in the U.S. — they used to be a thing decades ago, but beyond singing along to movies, they've largely gone away. He noted that Sweden still has a summer singalong that's been going on for 70 years, and in a country of 10 million people, 2 million watch it. Mirisch also wants to focus his next year as mayor on arts and culture more broadly. His big dream: a high-level art museum. "That's rather ambitious, but we have a lot of amazing collectors who live in our city, and I would love to figure out a way for our city to also include a world-class art museum," Mirisch said. Who can live up to all of the hype?